Annamrita means “food as pure as nectar.” Poverty and hunger in India are epidemics, with a majority of the population unable to get even one nutritious meal a day. The major factor behind this social calamity is a vicious circle of poverty and illiteracy that has gripped India for decades. Annamrita has resolved to liberate the underprivileged from this vicious cycle by serving children with the purist plant-based meals. The meals are not only strictly plant-based but are also imbued with the spiritual ambiance of annamrita’s hi-tech, super hygienic kitchen. They believe such pure food will nourish the mind, body, and soul. 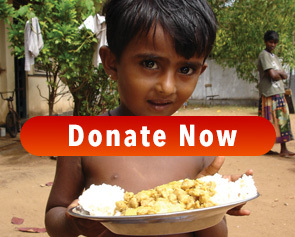 To many, annamrita is the sole source to their only complete meal that they have access to during the entire day. This has produced dramatic results in terms of increased enrollment at schools, retained attendance levels, reduced dropout rates, and attention spans. We sincerely seek your support in reaching out the annamrita program to more and more children.